We’ve always loved Alfred Hitchcock’s films and we think it’s time to make them fashionable again to a new generation of graphic designers because there are some truly inspiring art direction in his films. Check out (or revisit) the opening sequences in Vertigo and North by northwest for their clever use of imagery, graphic design and typography. Proves that some things from the past do look better (mainly because they’re simpler), and it’s got nothing to do with nostalgia and everything to do with strong, relevant and timeless design. 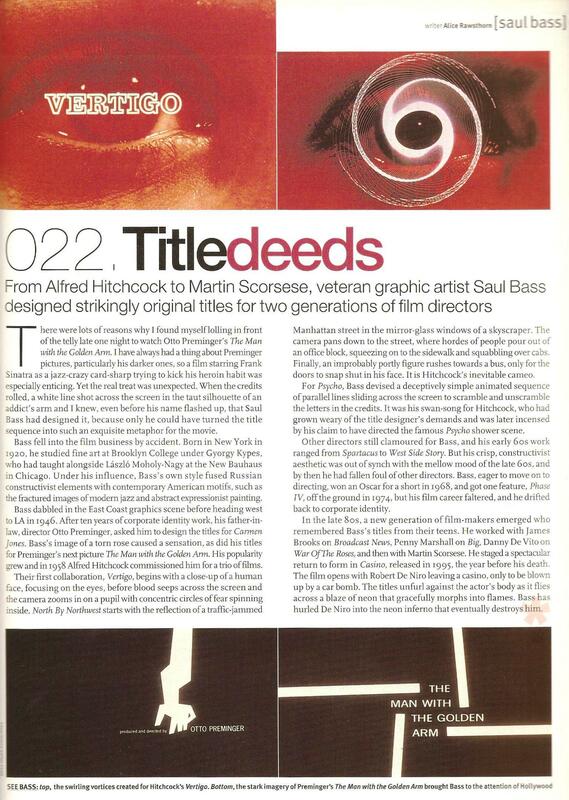 Below is an article about Saul Bass, the art director responsible for the famed opening sequences above, published in a 1998 issue of Wallpaper* magazine, lauding his work for Hitchcock and other film directors.